Following a deluge of complaints from the general public, North Norfolk District Council (NNDC) has been forced into action to take down netting that was recently erected on cliffs at Bacton. 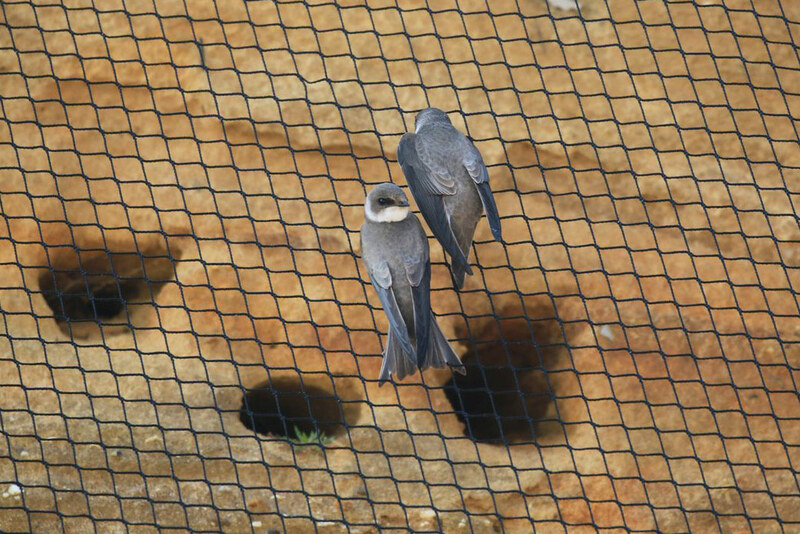 The netting was initially put up to prevent Sand Martins from returning to their burrows at a traditional breeding colony along the cliffs so that the council could carry out essential works as part of the Bacton Sandscaping Scheme, which it describes as a "critical project to protect people's homes and national infrastructure." The erected netting at Bacton is particularly cruel as the birds can still see their nest holes yet, no matter how they struggle, cannot reach them (Maggie Wilcox). This summer, 1.8 million cubic metres of sand will be placed on the beaches to provide robust protection to Bacton Gas Terminal and the villages of Bacton and Walcott for a period of up to 20 years. While local residents and businesses will ultimately benefit from the work, which will protect the coast from winter storms and rising sea levels, its timing could not have been worse for the population of Sand Martins that uses this sandy section of the north-east Norfolk coast to breed each year – something that conservationists were quick to point out. Local residents raised their concerns via social media, pointing out their disappointment that the colonies had been covered by the netting. This rapidly went viral as emotive footage showing the Sand Martins trying their best to find a way through the netting back to their natal burrows, which they could still see through the mesh, spread around the online world. By mid-afternoon on Tuesday [9 April], the original footage had generated 1.6 million views and more than 7,000 retweets on Twitter, as well as thousands of comments from the public expressing varying levels of disgust. The RSPB was quick to condemn the actions of NNDC, releasing a statement to suggest that the council had ignored expert advice and unnecessarily netted the entire cliff-face, obstructing all nest holes, rather than just a small section that was at risk from the sand-dumping activities. The organisation commented: "We can confirm that the council's actions do not follow RSPB advice, or indeed their own construction plans. "In an effort to minimise the disturbance to nesting Sand Martins during the sandscaping project at Bacton, we supported the contractors' recommendation for NNDC to use a fine mesh (geotextile – which birds cannot get trapped in) on a small section of the cliff. This was to close off a small number of burrows that could have potentially been smothered by the newly deposited sand. We believe this action should have been taken as a last resort and only if alternative nest sites close to the original burrows were available. "Based on the images we have seen published, our advice has not been followed and we will be reaching out to NNDC to offer further advice and support." NNDC has subsequently come in for almost unprecedented levels of criticism from conservationists and the general public alike for actions that have been described as "callous", "uneducated" and "mindless". After releasing an initial statement on Monday [8 April] which appeared to defend the use of netting, the weight of bad publicity bearing down finally forced the council into an embarrassing U-turn on this stance, with a second statement announced on Tuesday afternoon acknowledging that the issue was of "top priority" and that the upper section of netting would now be removed by contracted experts "in the next 24 hours" [that is by the end of Wednesday 10 April]. However, a lower section is set to remain netted, with this now the subject of further complaints from the public across social media outlets, and an update on Tuesday evening suggested that the removal will now not take place until Thursday 11th. This belated action may ultimately prove in vain for the 2019 breeding season at least, for the local Sand Martins trying to enter the nest holes have reportedly deserted the site – at least temporarily – following the upsetting footage being filmed on Monday morning. The RSPB has subsequently welcomed the updated statement and has revealed that it plans to meet with the council to discuss remaining concerns about the 1.3 km length of netted cliff-face that will remain in position.